Data from the Independent Electric System Operator (IESO) indicates July 2012 saw mild demand growth, over July 2011, of 1.2%, while prices look set to rise ~13% for Ontario's businesses. Regulated price plans had already been set 10% higher. The Hourly Ontario Energy Price (HOEP), with a weighted average of ~$33.65/MWh is 8% lower than in July 2011, leading to the likelihood exports were sold at a lower rate. The rise in price (from $64.97 to the preliminary estimate of $73.93/MWh) is far higher than my estimates indicate, and far outside the normal variance. At $599 million, the global adjustment is shown as increasing $207 million over July 2011, while the amount recovered by sales at the HOEP rates dropped about $43 million. This is extreme even in 2012's Ontario. I have fought the growing trend to refer to the global adjustment as a tax, but it is becoming murkier each day; as lawsuits are suddenly settled and revelations indicate net revenue requirements for natural gas generators have been drastically increased, it is increasingly desirable to have better disclosure on how the GA pot is being calculated, and allocated. 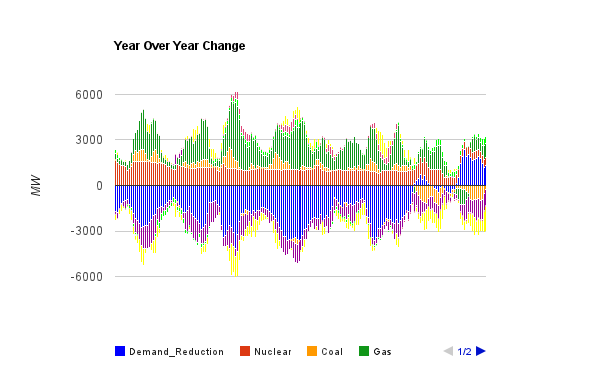 July did see declining hydroelectric production each week, which was compensated for by increased nuclear production, and far higher production from natural gas sourced generators - generators we have been led to believe we pay for all months to be available, and only for, essentially, the costs of fuel when used. That appears to be untrue as gas, particularly the net revenue requirements guarantee, is increasingly indicated to be the main driver of cost inflation in Ontario, both when used to generate electricity, and when it is idle. 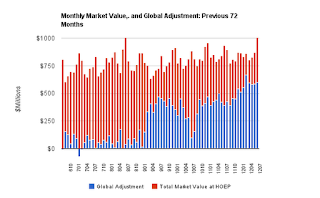 Due to the lack of accounting in the global adjustment (most costs are simply classified as "OPA") it is difficult to prove where the cost inflation comes from. My estimation of monthly costs has had solar production having a greater impact on bills than wind production (which is fairly well known) - and there are no production figures for solar anywhere. However, the OPA's most recent progress report on supply gives a figure on capacity that makes it hard to envisage solar driving up the July price to the extent the GA does - and wind produces less in July than any month of the year, so that is also not the cause. If you are a small business in Ontario, your rates are going up, but the explanation of why remains very elusive. azoles. fixedly fixings fixture fixures fizgigs fizzers fizzier fizzing.